Happy Monday, dear readers! I have no idea what happened to the weekend, but it is gone and another week has already begun. I can't believe it will be September in just a few more days and Halloween will soon be upon us! Until then, let's get some enjoyment out of the last of the summer, shall we? 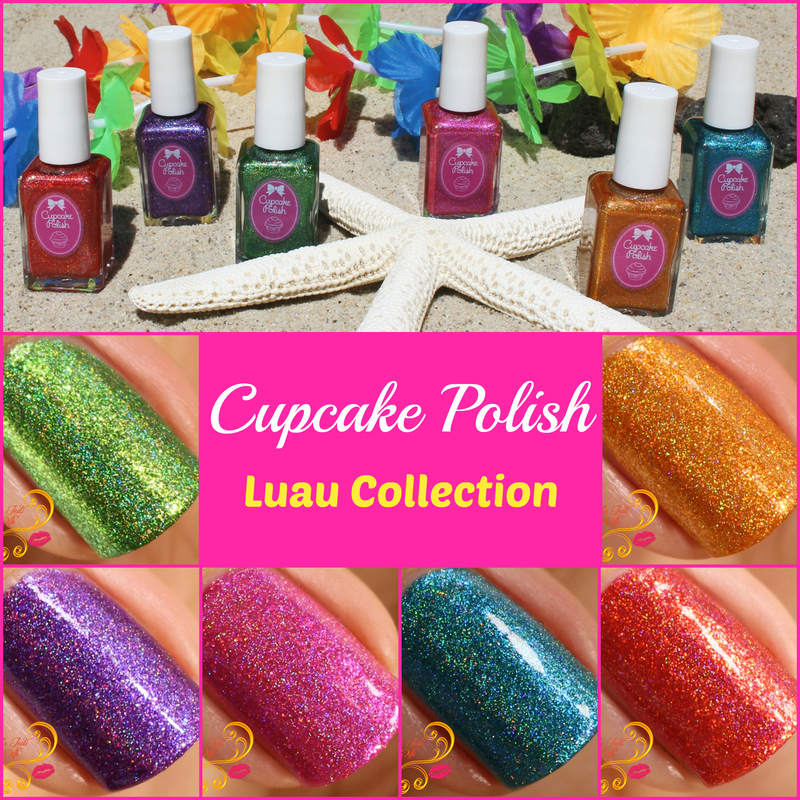 For today's blog post, I have the newly launched Luau Collection by Cupcake Polish to share with you. 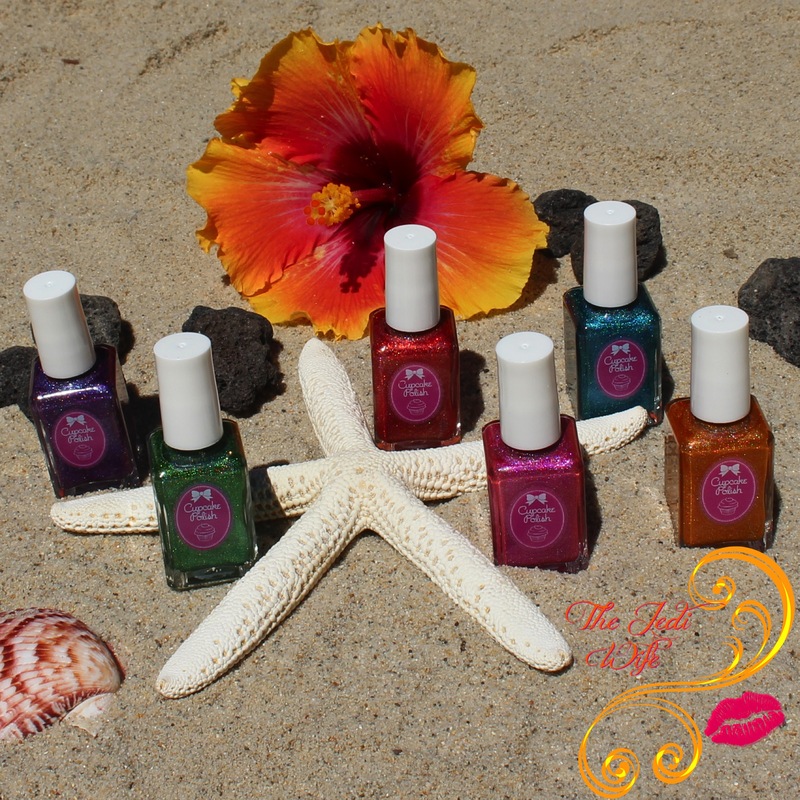 I have been to Hawaii a few times, so I was delighted to see the theme and the names of these gorgeous holos! I played around with a lot of different Hawaiian-themed props to stage a collection photo, but my favorite is this simple beachy scene with a hibiscus flower and complete with lava. It certainly makes me want to wiggle my toes in the sand while drinking a Mai Tai! Let's jump on in to the colours! That's it, I'm hoping on a plane immediately and heading to Maui! This polish makes me thing of the breathtaking scenic road to Hana in Maui, and I couldn't think of a more fitting name for this shade. This dark lime green holographic polish is filled with golden shimmers, reminiscent of the sunlight shining on all the greenery of the islands. The formula was top notch and applied perfectly for me. What's this? A sunlight shot? That's right, dear readers, I actually swatched these during the day when the sun was out for a change so I was able to snap a photo in natural sunlight to share. I hope you enjoy! 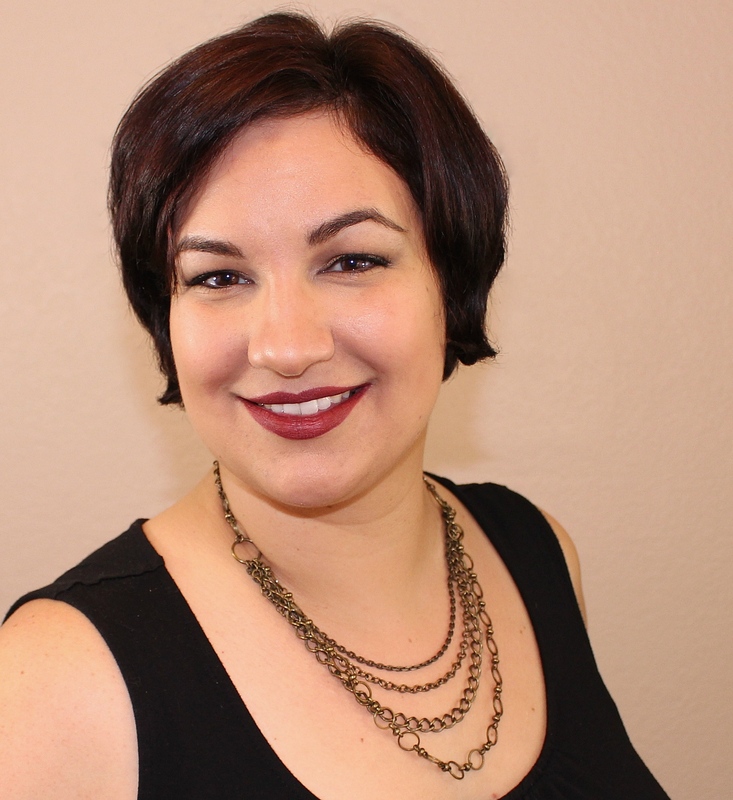 Sara certainly has a knack for creating gorgeous purple shades that I adore! While I've never seen a Hawaiian lei made with true purple flowers, this shade reminds me of the Purple Glory Bush in Hawaii. Both the flower and this polish have a touch of blue added, in the form of shimmers for the polish and a dark blue sheen for the flower; it certainly make this polish a stand out from the collection for me! The formula was superb and applied with two easy coats. I dare you to read the name of this polish and not think of the song Stand By Me. I cannot help but hum this song whenever I see it, and I cannot be the only one! It should come to no surprise to anyone that I love this colour! Orange is my jam, and the addition pink shimmers adds such a gorgeous twist to this polish! Of course not everyone is an orange fan like myself, but I strongly encourage you to give this beauty a chance. Not only is the colour awesome, the formula was fabulous! I just can't with these names- they are fabulous! 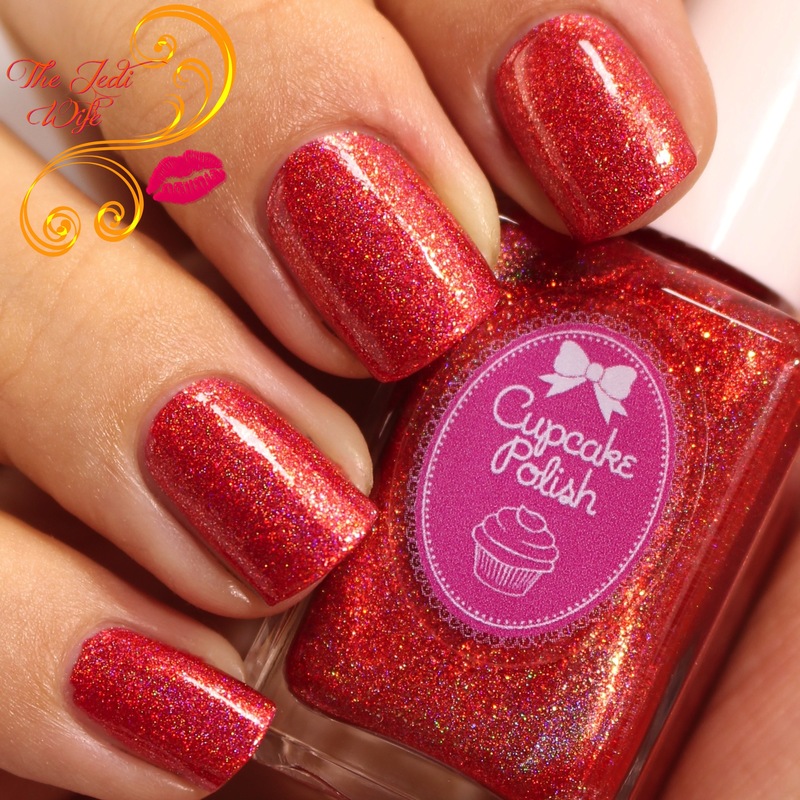 Cupcake Polish is well known for beautiful pinks, and I am lusting after this hot pink beauty. This is ALL THE PINK from the base to the added pink shimmers. The name is also quite accurate: a beautiful polish just might be a way to my heart! Like the rest of the collection, the formula is fantastic and will easily win its way into your heart! ....only not TOO Pacific because the Pacific is cold, at least alone the coast here in California! Be More Pacific boasts blue shimmers against the blue holographic base, and it certainly makes me think of the ocean! I am definitely a fan of all things ocean, so naturally I am infatuated with this dreamy polish. This polish applied as evenly as a tranquil summer sea. I'd love just about anybody that sends me to Hawaii! Oh, wait, that wasn't a question for me.... Hula Do You Love? is a gorgeous orange leaning red polish packed with holographic shimmers, and it makes me think of the traditional red hibiscus flower found all around the islands and in hula dancers' hair. Like the rest of the polishes in this collection, the formula and application were impeccable. The Luau Collection is currently available for purchase from the Cupcake Polish website located here. Each shade retails for $13. There is a listing for the full six-piece collection if you're like me and love all the shades! What do you think about the Luau Collection? Are there any shades on your wishlist? I'd love to hear from you! I love this whole collection! The names are great, the colors are great-- and your Hawaiian themed photo at the top is perfect! I wish I was on a beach right now! The green is probably my favourite but let's be honest they are all gorgeous! I absolutely adore this collection! Oh my these are so pretty!! I had to get the whole lot! I love this collection, especially Hula. These colors are so bright and vibrant! Love them! That orange jumps out at me though. Another Cupcake collection I totally need!!! Okay serious your swatches make me want this collection even more! Gorgeous swatches and very pretty collection! These are so fabulous, they make me want to wiggle my toes in the sand too! Hula Do You Love is my favorite! !